The Troodos Mountains located in the western part of Cyprus are probably the most fantastic and ideal on the island for life and leisure. The purest air, lots of fresh fruits from the local villages, views of the cascades over an evergreen forest, rocky slopes, cozy houses with fireplaces and an enternal silence from everywhere. The place is so magical that you want to stay here forever. The weather here is not as hot as in towns, it is sunny at summer and snowy at winter. Also the Troodis mountains probably have the best taverns with local cuisine and homemade wine on the entire island. Once you decide what you would like your dream house to look like, we will immediately start looking for the best option for you. Whether you are looking for a comfortable house for a romantic couple, a venue for the gathering of best friends or a big house for a family we will consider all your requests. There are houses available for sale in a tiny but very popular tourist village Platersor that are perfect for a relaxing retreat, also there are nice houses on a canyon mountains of Kakopetria. The range of the houses in the mountains is smaller than on the coastline, so the prices of apartments, maisonettes and houses are significantly lower. There are ski resorts and mountain waterfalls in the mountains of Troodos. Among the most remarkable villages there is Omodos that has local wineries and glass blowers, and also Agros with beautiful pink trees and a rose factory. 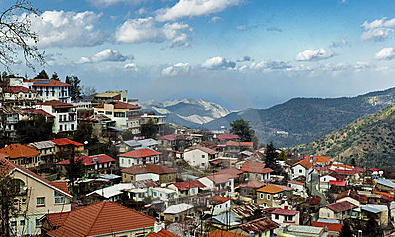 One of most famous monasteries of Cyprus is also located in the Troodos mountains. It is a monestery of Kykkos that was founded by the Byzantine emperor in the late 11th century and is situated at an altitude of about 1140 meters above sea level. There are plenty of local food markets that are open weekly on the streets of Troodos villages. There are also those that are open daily. In such markets you will find a great variety of fresh fruits, delicious nuts, local homemade sweets and pickles that are made usind traditional Cypriot receipies. If you are not sure whether the mountains of Troodos are ideal for your lifestyle you can rent an apartment or a house for a season or weekend in order to expirience it. We recommend options of wooden chalets with fireplace, brick and prefabricated houses with spacious rooms and beautiful villas with endless views over the forest.